A short time ago a vessel of very novel description appeared in the East India Docks. She was of iron built in compartments or sections, with this remarkable peculiarity, that each section, instead of forming part of an ordinary rigid, indivisible vessel, as in the ‘Great Eastern’, was a distinct vessel, complete in itself, and connected to the other sections by a movable joint of extreme simplicity and immense strength. The joints were constructed by giving to the after end of each section a concave form, enabling it to contain and overlap the convex bow of the adjoining section. Through the overlapping parts, at the sides of the vessel, were inserted massive iron bolts, resting in stout wrought iron sponsons, firmly attached to the ship’s sides and framework. These bolts, which constituted the pivots or centres of the joints, were attached to powerful levers under the decks, by means of which they could be drawn inwards for disconnecting, or pushing outwards for connecting the sections. The vessel was, in fact, a “jointed ship,” capable of bending at the joints both upwards and downwards, accommodating herself to the rise and fall of the waves, and fitted with powerful gear for instantaneously detaching one or more of her sections when required. The following desiderata are stated to be attained by this new system of naval construction: - Vessels of exceedingly light draught, and of length far greater than hitherto, carrying the largest cargoes, may be used without danger of breaking their backs, or even straining; the yielding of the joints obviating that liability. 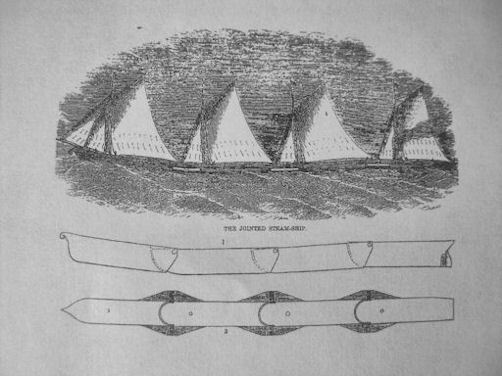 The great length, light draught, and narrow midship section, permit the attainment of unprecedented speed; whilst the facility for detaching part of the vessel in case of collision, fire, sudden leakage, or grounding with a falling tide, affords a means of saving life and a portion of hull and cargo, when otherwise all would be lost. In steam shipping a great economy of time and expense is effected. One section carries the engine and the crew; all the other sections are appropriated to cargo. On the arrival at its destination of a “jointed ship,” the engine and screw section is immediately detached, transferred to another jointed vessel of same gauge of joint, and dispatched at once, without incurring the delay of unloading one cargo and loading another. The detention of marine engines during repairs of the hulls is also avoided by this system. The sections of jointed vessels can load at inland ports, proceed separately, by canal or river, to the nearest seaport, there connect with the steam section, and take their cargoes direct over sea, avoiding the delay and expense of transhipment. Our Engraving represents an iron screw-collier, which the Jointed Ship Company, of Rood-lane, are going to run as a pioneer vessel in the London coal trade. Her coal-laden sections, when detached from the steam section, will act as lighters, and deliver their coals direct to all waterside premises, docks, canals, and creeks, of the Thames; avoiding the expense of coalwhipping, and loss by breakage of the coals.